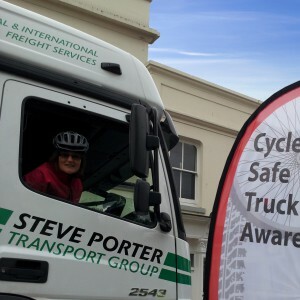 The Road Haulage Association (RHA) backed up their safety message last weekend by giving cyclists a ‘cab-eye view’ of what happens around a truck. In conjunction with member firm Steve Porter Transport, the RHA allowed cyclists into a typical cabin on Saturday at the launch of the Isle of Wight Festival of Cycling, Newport. Rhys Williams, Area Manager of the RHA, said: “Our aim is to bridge the gap in understanding between cyclists and the haulage industry. “We take every opportunity to remind our members of the constant need to be aware of cyclists moving around their vehicles; and there is a need for cyclists to have a better understanding of HGVs. “That was clearly evident again on Saturday. “We were able to demonstrate the drivers’ view, literally – and show the areas where the driver’s view is limited. “It proved a real eye-opener to the cyclists present, many of whom took the opportunity to get into the cab and could see the risks of, for example, going up the inside an HGV. “Our thanks go to IoW haulier Steve Porter Transport and its staff for providing an articulated vehicle and really bringing the issues to life. “We were also delighted that Rob Flello MP, Chair of the All-Party Parliamentary Group on Freight Transport, was able to find time to cross the Solent to support this initiative.